WASHINGTON, DC - (@TheComedyNews) - Now that President Barack Obama has signed the Budget Control Act of 2011, the good news is the United States does not default on their debts. The bad news? Pork barrel programs that were deceptively added by greedy Republicans, Democrats, and Joe Lieberman for Connecticut party members. -The withdrawal of funds for extraterrestrial nourishment in Area 51. -The elimination of talking toilet seats from each Governors personal bathroom (yes it was federally funded); the House and Senate retain their toilet seats. -Federal subsidies for celebrities to get out of jail for excessively large bails. 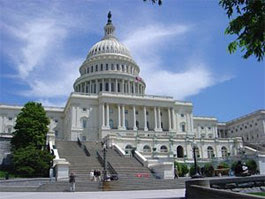 -Vouchers for federal legislators to receive elective plastic surgery. -Eliminating funds for the biweekly keg party in each federal circuit court. -Government contracts to businesses to produce small American flags that are provided via air drop to Third World Countries and China. -Federal loans to Greece to help end their recession in exchange for 6 Billion pounds of lamb. -The confirmation of Pete Rose to head the Internal Revenue Service.